I’ve written previously on the Japanese garage band scene and it’s amazing ability to take the basics and put their own indelible spin on it. Another area that is just as important but often neglected is the art angle. Shows need advertising. And while the Japanese scene boasts its own lineup of stellar illustrators, the one most often pointed to as the Grandaddy of them all is Rockin’Jelly Bean. Starting as a way to advertise his surf-garage band (the amazing Jackie and the Cedrics) his style of art evolved into a combination of 50/60s pinup girls, and 70s exploitation movies with a smattering of eroticism. Success and accolades soon followed allowing RJB to open up a store, Erostika, in the Harajuku area of Tokyo, followed by another one in Nagoya. Personally, I am indebted to RJB for being kind enough to encourage me to bring many of the images on this site to Japan for a gallery show in Shimokitazawa as well as an additional show at his store in 2009. At that point I had only begun exploring what to do with the images I had collected. It was mainly through his encouragement that much of what you see here became a reality. Which brings me to the point of this post! On October 8, Rockin’ Jelly Bean brings his amazing art stateside with a rare NYC appearance in Toy Tokyo’s basement gallery at 91 Second Avenue. Previously, the last time RJB was in town was in 2011 with Jackie and the Cedrics for the Norton Records 25th Anniversary shows. If you’re in the tri-state area, stop by and bask in the masters glow….I sure will! 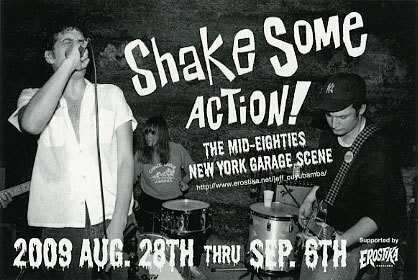 While I do not find myself out and about nowadays, I’d be remiss if I didn’t mention a few of the groups that are to this day flying the 60s garage punk banner in NYC. First up is these fab Brooklynites. The Above have been around for quite a while and probably take the award for stick-to-it-iveness. Much like the great bands of days gone by they blend a unique, yet familiar, mix of R&B, Soul, Freakbeat, Garage and Beat. I recommend checking out their live shows as they rock like you wouldn’t believe. 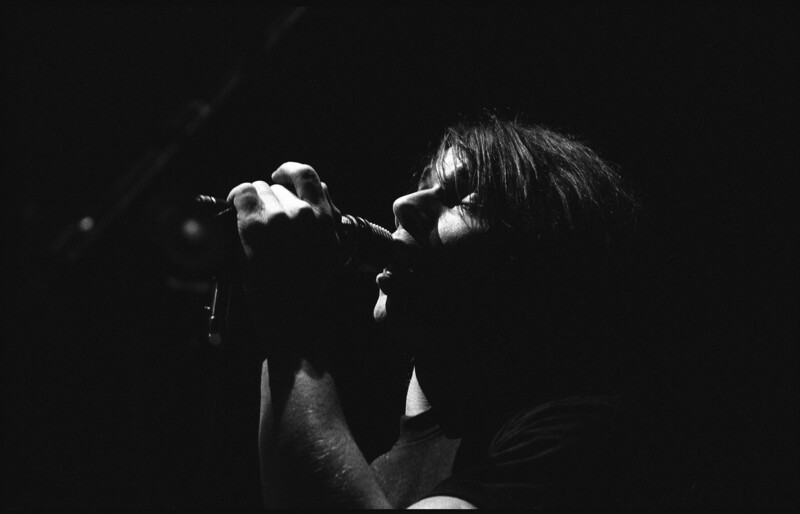 Michael Chandler of the Raunch Hands at The Palladium. However on that night, the main attraction was a brash punk-y roots-y band that truly exemplified the term Rhythm and Booze. While the “cowpunk” genre was already on its way out, what made this band stand out was the howling, skinny, lead singer. The band was rough, and sloppy with an intense energy that burned. Upon inquiring, I found out that this was actually the bands first performance and that singer, Michael Chandler, was formerly a member of the famed Outta Place. That night began what was to become many a night spent catching this amazing group. Through the years as Chandler went through different projects, he always remained humble, charming and a great person. The guy seemed invincible. Well, unfortunately that was not to be the case. Last year Mike was diagnosed with a rare form of neck cancer that necessitated aggressive treatment. Needless to say expenses mounted up. Which brings me to the point of this post. If the music of Michael Chandler and the Raunch Hands, or Outta Place ever meant anything to you. Then, its your time to give back. Please visit Mike’s GoFundMe page and say thank you. Thank you for the smiles, the fun and the great times that his performances always accompanied.